28 Vol.4 No.5 / May 2015 HOMEBUILDER'S HOW-TO IF YOU HAVE HAD to replace a cable on your aircraft, did you won- der where to start? Most cables go throughout the fuselage between bulkheads and around pulleys, fairleads, and guides of many descriptions. Not to mention, cables are also located inside the wing, where it is almost impossible to access them. At some point, all taildraggers will have to have their rudder cables replaced because of rust and wear and tear on the exposed portion that exits the fuselage to the rudder horn. I've seen cables that have been repaired by tying or taping them together only to have them come apart halfway inside. Now you have a real problem. The method shown here is the best way to solve this problem. The fi rst thing to do is to melt the cable of at the bad part with an oxyacetylene torch. (See Photos 1 through 4, 4a, and 4b.) The cable end will form a small ball, which has all the strands melted together, similar to melting a nylon rope with a fl ame. Take the new cable and melt the end of it the same way, with the end forming another ball. Next, with a steady hand, touch the two ends of the cables together and attach them to one another with a neutral fl ame from your torch. You will see the two ends melt together almost instantly. (See Photos 5 through 8.) Now tug on the cable and make sure it is properly fused. It is a simple task to pull the new cable in with the old one. 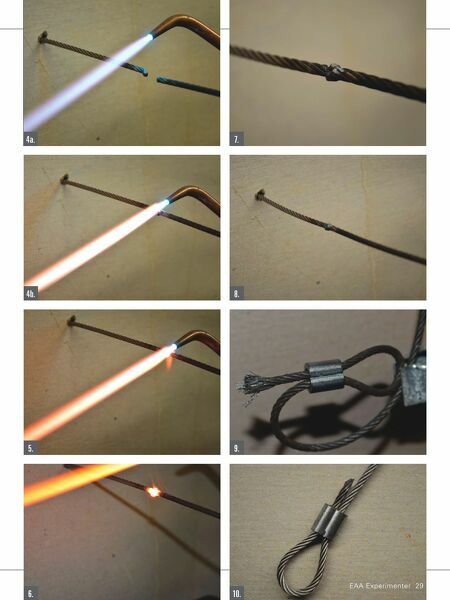 You will want to cut back the joint you have just made to get fresh cable, because when you heat aircraft cable, you burn away the graphite lube. (That is the dif erence between aircraft cable obtained from an aircraft source and cable purchased from your local hardware store.) You also can use this method to terminate the end of a cable, such as doing a loop with a Nicopress fi tting. Here are before- and-after photos of doing just that. (See Photos 9 and 10.) I did this on my own aircraft at the rudder pedals. After several pairs of torn socks from cable strands hooking them and several tries to corral the loose cable ends using glue and shrink tubing, this solution was fi nal. Remember to re-lube the cable after heating it and…do not start your aircraft on fi re! 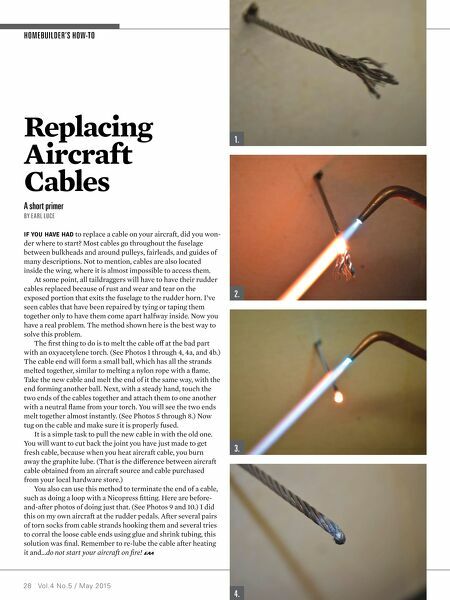 Replacing Aircraft Cables A short primer BY E ARL LUCE 1. 2. 4. 3.